"Class of '45 Reunion" sharing the Spirit of '45! 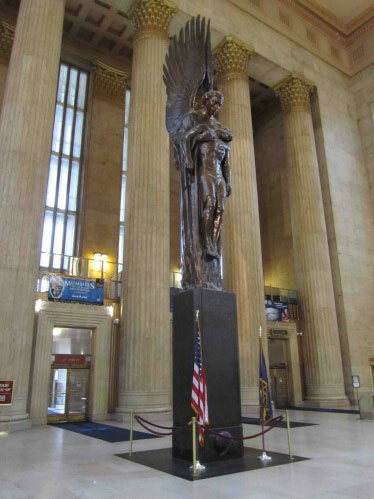 Hundreds of communities across America will be taking part in this year’s National Spirit of ’45 Day to honor the achievements of the men and women of the World War II generation as part of a grassroots effort to restore a spirit of national unity at a time when America is again facing historic challenges. Last year Congress unanimously voted in support of a national “Spirit of ’45 Day” to be observed on the second Sunday in every August, coinciding with August 14, 1945, the day President Harry Truman announced that the war was over. More than 800 separate events took place across the country last year on August 14, including observances in all 15 Major League Baseball games played that Day. 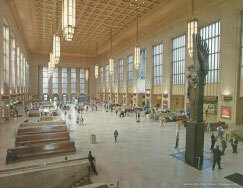 Dr. Cathy Gorn of National History Day will be calling on her network of more than 500,000 middle school and high school students to participate in the 2011-2012 Spirit of ’45 campaign. A 50 ft banner comprised of the photos of more than 1000 WWII veterans will be unfurled as a group of 20 buglers plays Amazing Grace and Taps to kick off a cross country series of wreath laying ceremonies to honor the 400,000 Americans who lost their lives in WWII and the millions who have passed away since the end of the war. Rae Smith (center) hold Spirit of '45 Day banner in Punchbowl National Cemetery, honoring the memory of her father who died in WWII. 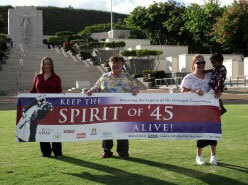 Vanita organized the major Spirit of '45 Night event that will take place on Saturday, August 13 at the Waikiki Shell. Eighteen Major League Baseball teams are having Spirit of ’45 observances this year, including some teams that participated in last year’s campaign, like the Los Angeles Angels, the Cincinnati Reds, the Minnesota Twins and the Kansas City Royals. Several teams have given out free tickets to WWII seniors so they can come out to be honored during their games. The San Diego Padres have produced a video narrated by Jerry Coleman, Spirit of ’45 national spokesman and Baseball Hall of Famer, which was distributed to all participating MLB clubs this year. 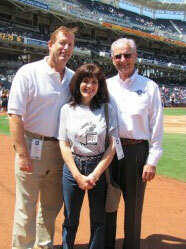 The Padres will be hosting a “Spirit of ’45 Night” at Petco Park at their Monday, August 15 game. The Padres and several of the other teams have given out tickets to WWII and current active duty vets so they can be together on this special evening during which the team management and players will be recognized for their efforts to keep the Spirit of ’45 in San Diego and throughout America. One of the largest events will be taking place in Hawaii where Vanita Rae Smith has organized a “Spirit of ’45 Night” on the evening of Saturday, August 13, at the 8,000-seat Waikiki Shell, featuring Country & Western Star Lee Greenwood and a tribute to Japanese America WWII veterans. The Battleship USS New Jersey in Camden, NJ and the History Park of San Jose will both be hosting major 2-day events that will feature hundreds of WWII re-enactors, museum displays, interviews with WWII veterans, live swing band music and other activities. 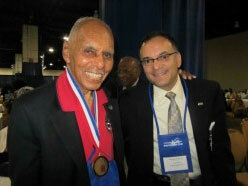 Spirit of '45 National Spokesman Dr. Roscoe Brown and Larry Roberts of Vitas, George, share a moment during the Tuskegee Airmen national convention in Washington, DC. A Navy veteran, Larry has personally organized more than 18 separate Spirit of '45 Day programs in the communities that he serves. 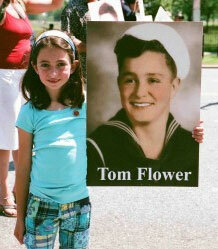 The History Park will host a special Tribute to Edith Shain, the “Times Square Nurse” who inspired the idea of a national day of remembrance for the “ordinary heroes” of her generation and campaigned vigorously for National Spirit of ’45 Day until her death at age 91 in June 2010. A 6 ft replica of the 25 ft Seward Johnson sculpture depicting the “kiss seen round the world” will be part of the Tribute. Vitas Innovative Health Care, a National Legacy Sponsoring Partner, is organizing hundreds of in-house events for members of the Greatest Generation living in senior and assisted living communities and state veterans homes in the 20 states where it provides end of life services. It is estimated that the surviving members of the WWII generation are now passing away at the rate of one every 90 seconds. National Spirit of ’45 Day provides an opportunity for America to be reminded of a time when everyone in our country came together as a community to deal with major challenges. August 1945 was the Greatest Generation’s greatest day, as they turned from the destruction of war to the work of building a better world for their children and their children’s children. American of all ages can draw inspiration from how they dealt with adversity their example of courage, self sacrifice, can do attitude and shared responsibility. National Spirit of ’45 Day is a nonpartisan, nonpolitical initiative supported by donations from the public and is seeking funding and in-kind support from several corporate sponsors that share an interest in promoting greater national unity and cooperative action to deal with the many critical economic and social issues facing America.